A handful of collectors in the UK spend the better part (in more ways than one) of their spare time actively seeking out worldwide ethnic music which appeared originally on 78 rpm shellac discs. We buy the original discs whenever opportunity and cashflow permits. We trade tape dubs of the originals with other like-minded souls. We buy reissues in other formats and running speeds whenever a commercial company believes it can either make a buck, or feels altruistic/honour bound to make the music more generally available. Among ourselves we discuss the music, the artists, the context of performance, the recording process. An unusual and exotic 78 rpm record label may send us into paroxysms of delight, especially if never before seen. This semi-autobiographical rambling does, in fact, have some relevance. One perk of being known for such eclectic taste is that journal editors (and, despite the cyberspace format, don't let anyone tell you Musical Traditions is anything less than a highly-respected journal) continue to offer diverse genre releases for review. Bearing all that in mind, imagine my excitement and delight when, hot on the needs of the fabulous Armenians on 8th Avenue (which featured 22 tracks from the rare post-war New York labels Kaliphon and Balkan, and is reviewed elsewhere on the site), up pops this multi-faceted gem. A further 22 titles, mainly of the same vintage and location, from the equally elusive Alamphon, Al-Chark, Cleopatra and other 'down home' labels, which catered to a specific ethnic audience that the mainstream companies had dismissed. Once again, I am truly in 78 collectors' heaven. My track count requires an explanation. I attribute 22, yet the sleeve lists only 14. The confusion arises because eight of those are two-parters, issued originally on both faces of a 78 rpm disc. As the notes observe on page 5 (the booklet is unpaginated, but counting the cover as 1), it is practically impossible to satisfactorily contain any Arabic tune or song on one three minute side. Even taking a break and developing the theme further on a second side must have been frustrating for both musicians and vocalists. Yet that remained the reality for half a century prior to the advent of the long playing format. Om Kalsoum might well extend a number for twenty or thirty minutes in live performance (and there are many examples available on the EMI/Cairophon label), but get her into a recording studio and onto a ten inch Odeon or HMV double sided disc and seven minutes is just about the limit. Musical style and performance of all titles are analysed in such depth in compiler Anne K. Rasmussen's notes that most comments I could make would be redundant. Which leaves my personal reaction to the music: perhaps as it should be in a review. Rasmussen notes (page 7) that the musical arrangement Fatima by the Maloof Oriental Orchestra features a good deal of Westernised influences. I would go further and observe that the line-up features none of the 'classic' instruments traditionally associated with Arabic music, and heard on the majority of tracks here. What struck me, in fact, was how similarly brass and woodwind-orientated it was to many contemporary klezmer bands. I guess the line-up as noted must derive from original company recording sheets, though, for I hear an un-credited violin but no banjo. And 'various percussion' surely consists of drum and hand-held cymbals. But by far the most modern and Westernised sounding track on the CD is Al-Jazayer, with its syncopated, almost hot, rhythmic structure. I suppose it should have come as no surprise to learn from the notes (page 20) that violinist Philip Solomon was not only a member of the Rhode Island Philharmonic Orchestra, but was known locally as 'the king of jazz'. The mellifluous improvisations of Sana Khadaj on Lamma Ya Albi are very fine throughout, with those towards the end of Part 2 being particularly sublime. Beginning with a restrained vocalised passage, the rhythm then changes and the tempo speeds up twice before Sana reappears (sound clip). On Raqs 'Arabi, Naim Karakand's violin weaves and soars majestically (sound clip), while the piano is deep and rumbling, with a tonal quality rivalling an upright bass. He accompanies various of the vocalists heard here, always faultlessly, but also takes centre stage on a further instrumental track. This is the second oldest item here, from a twelve inch Macksoud disc, with the unprepossessing title of Flute Imitation. This leaves one totally unprepared for the stunning virtuosity of the playing. With all violin strings tuned to the same note, one pair an octave lower than the other, he convincingly emulates the tonal quality of a double reed flute. Playing the strain in the high register, then the low, he consistently double stops his strings, occasionally plucking them for effect. Although often implied during many tracks on this CD, this piece features the only really explicit use of non-Western quarter tones. The standard of musicianship is exemplary throughout, though certain passages inevitably shine above the rest. One such is the ensemble in full flight on Wakef 'Ala Shat Bahar, but which also finds time during its seven minute duration to accommodate fine improvisations on the oud, qanun (or plucked dulcimer) and violin in turn. Again, on Li'b Al-Khayl the unknown player and Muhammad Al-Akkad are particularly inspired as their violin and qanun interweave excitingly (sound clip). 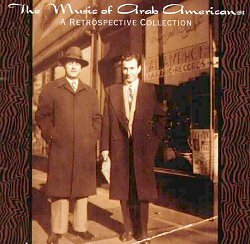 During the same year that he played Tin Pan Alley songwriter Gus Kahn opposite Doris Day in I'll See You in My Dreams, and a little before reprising the Al Jolson role in the remake of The Jazz Singer (both for Warner Brothers), Danny Thomas (real name Amos Jacobs) recorded this coupling of Arabic Folk Songs. He proves himself to be a fine vocal stylist, well able both to sustain notes and improvise freely, as tradition demands. Oud player Toufiq Barham provides a superb improvisatory passage towards the end of Part 2 (sound clip). In general, transfers from the original 78s are pretty good. There is an annoying swish during Lamma Ya Albi Part 1, while the toppy tonal quality of the Constantine Sousse two-parter Il-Bulbul Nagha, the earliest item on offer here betrays its acoustic recording horn origin. Other than the odd clicks however, the original disc used must have been in remarkably good condition for its age. And the minor defects on other tracks can be easily forgiven when the absolute rarity of everything featured here is realised. In general there is, mercifully, no attempt during the two-parters to omit the break half way and 'seamlessly' marry the couplings, a jarring technique which mars certain tracks on the Om Kalsourn and Mohammed Abdul Wahab CD series on Club de Disque Arabe, and on the afore mentioned EMI/Cairophon Kalsoums. Where it doesn't sound too jarring, though, Rounder have reduced the gap to a minimum, but not made it a hard and fast rule. My reviews of reissued 78 rpm material almost invariably feature at least a few negative comments on discographical accuracy, and this is no exception (though, believe me, I look forward to the day when such criticisms become obsolete). I find it almost inconceivable that, seven years after publication, some researchers are still unaware of Richard Spottswood's mammoth tome Ethnic Music on Records. Yet Rasmussen is obliged to conjecture of the Sousse coupling (page 8) that, "Judging from the record number [i.e. Victor 69768], this performance was recorded in New York around 1916 or 1917." A simple check of Spottswood would have not only confirmed her location guess, but given a specific recording date - 8 October 1917 - and identified the musicians, unnamed in the booklet, as Naeem Karacand (violin), whom we've net before, Abraham Halaby (oud), and Shehadi Ashkar (kanun). The same entry would also have told her that Karacand's 'earliest recordings with American mainstream labels' date not from '1915 or before' (page 11) but rather circa August 1916. Such oversights are compounded by the revelation on page 21 that Spottswood actually loaned original discs for the project. Maybe the forthcoming revised reissue of his discography in the CD Rom format will rectify this ignorance factor. A certain carelessness in proof checking mars the booklet a little. The timing of Taqasim 'Ala Al-'Ud (the form as given on the rear cover) is stated to be 6:25, when it is actually 3:25; while the first word is given as Taksim on page 18. One oud player's Surname is spelt Bedway on page 16, and Budway (twice) on page 19. Track five is titled Raks Arabi on the rear cover, but Raqs 'Arabi on page 11. I firmly believe that the actual title as rendered on the original disc is of paramount historical importance and should invariably be given, even where this may prove unsatisfactory to reviewers (viz. criticism of tile track listing in the review of my CD compilation Melodeon Greats - Topic TSCD 601 - on this site). Other minor complaints include some incomplete or erroneous identifications of vocal and instrumental line-ups, especially in the percussion department. The 'woodblocks' noted in the heading to Wakef 'Ala Shat 'Bahar are surely claves, which had spread extensively from popular Cuban usage into many diverse traditions by the late 1940s. The extensive vocal chorus group on Only You is omitted from the notes altogether. But do yourself a favour. Ignore every single one of my criticisms, take on board only the positive sections of this review, and order this CD (UK readers can get it from Red Lick Records) with no further delay.